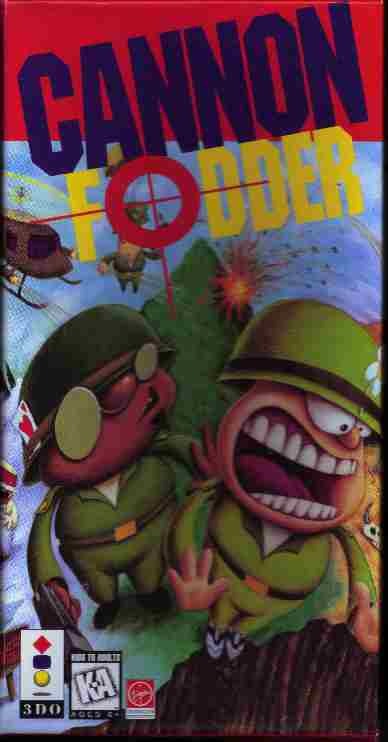 Cannon Fodder is an old PC game that I used to always play. The 3DO version is actually a near exact port of it except it doesnt have mouse support which is no good. The mouse would have made it perfect. Cannon Fodder is a sort of army sim where you get 3-6 men to complete a certain task. There are 3 weapons; gun, grenade, rockets. Gun is unlimited and the others you have to find or start out with a few. Cannon Fodder also has a point-n-click interface. I really like the cartoony graphics in the background and also the in game graphics. They aren't all that sophisticated but just look fun to play. The explosions look pretty cool as well. Only real complaint and the one thing that doesn't make it a perfect port graphically is that sometimes while you're playing, the trees sometimes have in the middle of a big clump of them a spot that isn't supposed to be there but looks like ground. Its hard to explain but if you have seen this you know what I am talking about. The sounds are all right but nothing spectacular. It would have been very cool if the background music would have been that of Return Fire but that just aint the case. They are average, but the gun fire is pretty good and so are the grenades and rockets. The killings sound lame but a little funny and that is what this game is all about, fun. Control is pretty good but would be much much better if the mouse was supported. This would have made the game even closer to the pc version. It is not quite as easy to go to a specific location quickly or to go around enemy fire as efficiently, but the 3DO game pad gets the job done and is more than playable. But it just seems kind of a tease to have the cursor like that of the mouse pointer on a computer. This game is very fun and addictive. If you always get hooked on games that have tons of levels and is quite fun you will find yourself trying to beat it to the end. This just has so many missions and scenarios it is just too much to take sometimes or too hard. That's the one thing wrong with this game. The difficulty is a little tough on some stages. You will find yourself very frustrated every once and awhile. I dont know if the 3DO version is true to the PC because I have the demo version, but as far as I can tell the 3DO version is probably about 3 times bigger. The PC version had quite of few stages too. CF gets really fun when you get blow up a ton of houses and see the roof come falling down on an enemy(but you will be really mad when you see that roof kill you the next time if you aren't lucky!) but it gets to the full enjoyment of the game when you get to use the vehicles! It is just an awesome game when you get to use them. Like the snowmobile going over the ramps, or you running down someone in a jeep. Fun fun! This game is just awesome in gameplay if you like these little war type strategy games where you get a few men and try to defeat all of your enemies or destroy all of their buildings or both. A solid title that will make you happy if you purchase it for under 10 dollars or so. Quite good and you get a lot of gameplay for your buck. Go get it if you like little war game shooters.